Here we are at the Elks Club in Lakewood Washington. Since this is our very first time staying at one since becoming Elks, we thought we would share it with you! We have been talking about it for a long time, I know, and finally it has become reality! As you know, Dad had to work up here in Tacoma, so I decided to tag along this time. We had a smooth haul up here and drove easily into the parking lot here. They don't reserve sites, they just say "Come on up!" if there is room, so we parked in an available site and got set up. They only have 30 amp electrical hookups here so it will give us a chance to test our new solar system in that scenario. We can dial-down the consumption of the battery charger to whatever we like, and in this case we dialed it to "30". You can dial it way down as needed if you are driveway surfing and plugging in to somebodies small 15 amp outlet. Pretty cool. Our inverter will "assist" with battery power at whatever level needed, and the batteries will be getting a passive charge all the time. We went into the bar and paid our fee: $100 for the week. That includes water and electric and there is a sewer dump as well. Not bad! 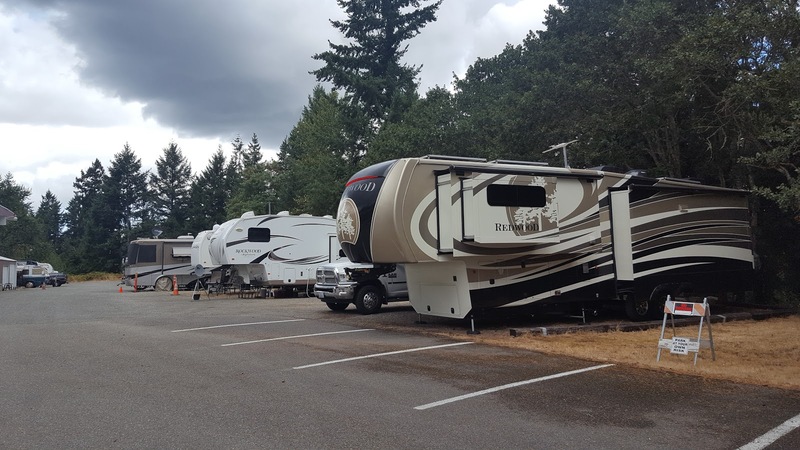 Especially in this area, the Seattle area is notorious for having slim pickings for RV stays, especially affordable ones. We are pretty happy! We rejoiced at the rain storms that began arriving the next day! The entire Pacific Northwest has been on fire, and it's been a while since we have been able to breathe clean air. What a blessing. It has been about 4 months since we have had any rain, and it's so dry. I can't remember the last time I enjoyed rain so much! We certainly aren't getting much solar power, but in this case, I don't care! Well, that's about it for now. We will be here until Saturday, and then back down to our park. Hope the rains keep coming for a few more days! See you soon! Love, Mom.